This 1/3 carat engraved hearts diamond engagement ring in 14K white gold provides a feminine expression of overflowing love! 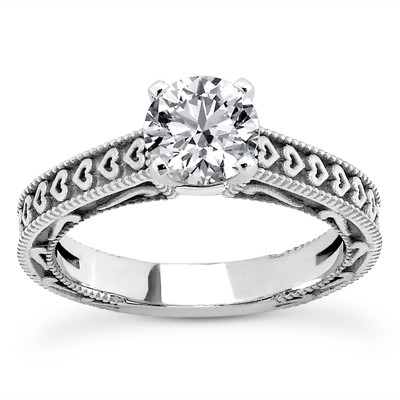 A round, prong-set, third-carat diamond is the focal point of this ring, and it overlooks an impeccably-accented band. Tiny hearts are repeatedly carved into the outer surface of this 14K white gold ring, while simple swirls are carved into the sides. These motifs are offset in classy fashion by petite milgrain edges, completing a look that will never fail to celebrate your affection. 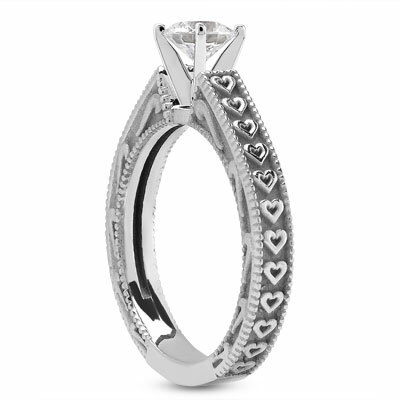 A 0.33 carat engraved hearts engagement ring in 14K white gold. Apples of Gold Jewelry guarantees the 1/3 Carat Engraved Hearts Diamond Engagement Ring to be of high quality and an authentic engagement ring with real diamonds, as described above.